Harrier Search Ltd is a ‘data controller’ when the company directly collects personal data on individuals through different mechanisms, including employment candidates volunteering their data, or by using publicly accessible Job Search databases. Harrier Search Ltd is also a ‘data processor’ when it receives and uses personal data that has been collected by individuals and companies that it works on behalf of. Within this policy we will be referred to as “we”, “us” or “our” for simplicity. The company’s contact details can be found on page 4. We will review this policy regularly to ensure we are compliant with any changes to data protection regulations. Harrier Search Ltd collects personal data about you as part of the functioning of the company. This personal data might be, for example, such as name, address, e-mail and telephone number, employment history and academic achievements. We do ask for an idea of candidates’ current and expected salaries, but this is to help Harrier Search Ltd provide a better service and will not be shared with any of our clients. Your consent: This applies where you provide your personal data and consent to us using it to provide you with a specific service. At times, we need to know your personal data in order to contact you as set out above. As part of our work, we might compile personal data about you using publicly accessible databases or government registers as set out above. We will only gather this information as part of performing our work. Where this data is not obtainable online, we may write to you to request your contact details so that we can directly engage with you. Harrier Search Ltd’s core use of personal data is to assess and recommend candidates on behalf of our clients. Personal data may be used if we need to perform a contractual obligation based on our work with third parties (companies and individuals), or to comply with a legal or regulatory obligation. As part of our contractual obligations, we are required to seek your permission before adding your contact details to any databases which are held by the third parties from whom we undertake contractual obligations. We will always contact you before sharing any personal data to seek your approval for Harrier Search Ltd to pass on this data to third parties. Harrier Search Ltd will seek written confirmation from the third parties to ensure that they are compliant with all applicable data protection regulations. Harrier Search Ltd does not at this time use personal data for marketing purposes, and we will contact candidates in advance before any marketing initiatives such as a newsletter are commenced. Further to section 4, we may have to share your personal data with other parties based on legal requirements. This could include other contractors working with the third parties from whom we undertake contractual obligations, for example a third party providing background checks. Harrier Search Ltd will seek written confirmation from the third parties to ensure that these contractors are compliant with all applicable data protection regulations. Harrier Search Ltd will not transfer your data beyond the European Economic Area unless the candidate has consented by listing a specific non-EEA country in their Candidates Form. We have taken necessary steps to protect your personal data from being accidentally lost, used or accessed in an unauthorised way, altered or disclosed. Harrier Search Ltd is committed to storing as little personal data as is required based on our contractual obligations. Personal data is stored on hard copies or computers and external hard drives held by the owner. These computers are password protected and have up-to-date anti-virus and malware protection software installed. No information will be passed on to third parties without informing you and obtaining your consent. There is one member of staff in Harrier Search Ltd. This person has attended an external training event (organised by the Royal Institution of Chartered Surveyors) on data protection regulations, particularly the General Data Protection Regulation. You will not have to pay a fee to access your personal data (or to exercise any of the other rights). However, we may charge a reasonable fee if your request is clearly unfounded, repetitive or excessive. We may need to request specific information from you to help us confirm your identity and ensure your right to access your personal data (or to exercise any of your other rights). This is a security measure to ensure that personal data is not disclosed to any person who has no right to receive it. We may also contact you to ask you for further information in relation to your request to speed up our response. We try to respond to all legitimate requests within one month. Occasionally it may take us two months rather than one month if your request is particularly complex or you have made a number of requests. If you are not happy with any aspect of how we collect and use your data, you have the right to complain to the ICO, the UK supervisory authority for data protection issues (www.ico.org.uk). 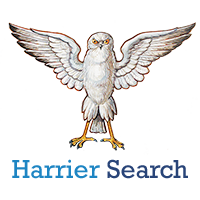 We would be grateful if you would contact Harrier Search Ltd first if you do have a complaint so that we can try to resolve it for you.